'Maholia (Berberis) aquifolium.' Photo by Wikimedia Commons user Meggar. Many scientific discoveries affecting our health have come from research done with plants from rainforests. Did you know native rainforests of the Pacific Northwest, including the redwoods, have contributed greatly? Very important historical and contemporary medicinal compounds have been isolated from native plants of California. Often these pharmaceutical breakthroughs originated with the native wisdom of indigenous peoples. Every plant discussed in this article has a traditional use among Native Americans. There are a number of different ways these plant medicines have been converted to modern forms of medication. The Cascara Sagrada tree, Rhamnus purshiana, has been given its common name because of its "holy bark." Native Americans shared the use of this plant centuries ago with Spanish Missionaries. It is a very strong laxative, and was harvested here in the Pacific Northwest until very recently for use in products sold by the pharmaceutical companies. After decades of attempts it has been synthesized -- scientists can create a copy of the medicinal molecular compounds using other source ingredients. This tree is common in Humboldt County. 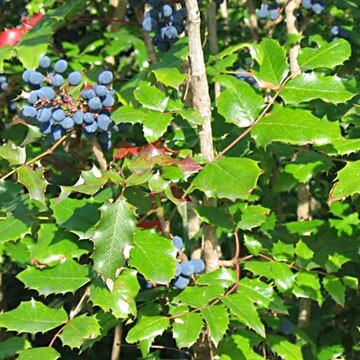 The state flower of Oregon, scientific name Berberis aquifolium, or tall Oregon grape, has been clinically proven as beneficial for dry skin conditions like eczema and psoriasis. Multiple pharmaceutical companies in Canada and the United Kingdom have in the past seven years developed pharmaceutical grade creams that have the plant chemicals, called alkaloids, from Oregon grape. These are not harvested in the wild but grown in cell-culture: large vats of cloned cells that are stimulated to release the chemicals. Oregon grape can be seen in northern California in the wild and sometimes as an ornamental. Inside-out flower, Vancouveria spp., also called duck's foot (for the shape of its leaves). In the early 2000s scientists from multiple large universities and pharmaceutical companies in China and Japan developed an anti-rhinitis inhaler drug based on its alkaloids, providing long-lasting relief for severe allergies. This unique plant is common in the redwood forest. The Yew tree, Taxus brevifolia, was during the 1990s exploited to near extinction for its anti-cancer properties. Once thought to be only in the bark of the tree, taxol (a copyrighted name for the alkaloid), now can be obtained from needles as well. It has recently been synthesized. During the development of the modern anti-cancer drug, federal agents broke into the hotel room of visiting foreign researchers on the suspicion that they had somehow obtained secret information concerning the "taxol" molecule. The yew tree likes shady forested areas and is currently relatively uncommon in California. People from all over the world have benefited and will continue to benefit from our bioregions in California. Protecting them will provide for new scientific breakthroughs, discoveries and understanding. They are the source of well-being for ourselves and future generations. A submission of the Science Media and Communications Seminar at Humboldt State University. Contact: Jeffrey White, Department of Biological Sciences; jww12@humboldt.edu.